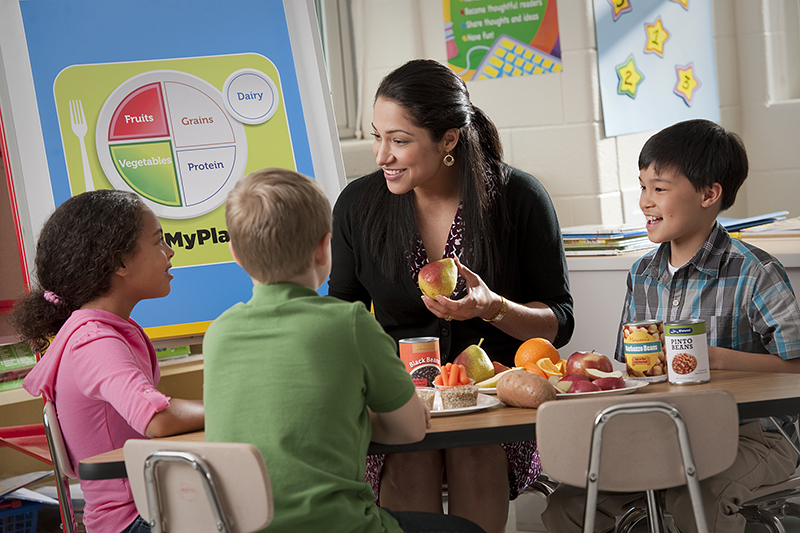 The MyPlate shows the five (5) food groups which are the building blocks for a healthy meal at your family’s table. The 5 groups are: Fruits; Vegetables; Grains; Protein; Dairy. Find more information about MyPlate at ChooseMyPlate.gov. Make ½ your plate fruits and vegetables. Any fruit is part of the Fruit Group. Fruits may be fresh, canned, frozen, or dried. Any vegetable is part of the Vegetable Group. Vegetables may be raw or cooked; fresh, frozen, canned, or dried. Based on their nutrient content, vegetables are organized into five (5) groups: dark-green vegetables, starchy vegetables, red and orange vegetables, beans and peas, and other vegetables. Make ½ your grains whole grains. Any food made from wheat, rice, oats, cornmeal, barley or another cereal grain is a grain product. Popcorn, oatmeal, bread, pasta, breakfast cereals, tortillas, and grits are examples of grain products. Grains are divided into 2 subgroups, Whole Grains and Refined Grains. Examples of whole grains include whole-wheat flour, popcorn, oatmeal, and brown rice. Examples of refined grains are white flour, white bread, and white rice. All foods made from meat, poultry, seafood, beans and peas, eggs, soy, nuts, and seeds are considered part of the protein group.Choose low fat cuts of meats and trim visible fat from meat and poultry. Choose low fat and fat free dairy. Milk and foods made from milk are considered part of this food group. The dairy group also includes calcium-fortified soymilk (soy beverage).